attorney, she acquired extensive courtroom experience, notably in the fields of insolvency, construction, insurance, civil and professional liability, and civil law. An accredited civil and commercial mediator since 1995, and a family mediator since 1997, she has focused exclusively on mediation, mediation/conciliation training, and arbitration since 1999. During the course of her career, she has conducted over 2 000 mediations, in French, English, or both, in the fields of civil and commercial law, insurance, civil and professional liability, power distribution, disability insurance, harassment, and family law. She has often been involved in multi-party mediations, whose high financial stakes and complexity carried the risk of lengthy trials. She practices in the Greater Montreal area as well as throughout Quebec and occasionally in Ontario. Dominique F. Bourcheix was an arbitration expert whose skills benefit CAMPAP (Canadian Motor Vehicle Arbitration Plan). In addition to serving as a consultant to the organization, she selected, trained and advised CAMVAP arbitrators. As well, on a regular basis, she serves as sole arbitrator or as a member of an arbitration tribunal in civil and commercial cases. Since 1995, she has conducted numerous training sessions in interest-based negotiation and mediation for various organizations including the Department of Justice Canada, the Canadian Radio-television and Telecommunications Commission (CRTC), the Royal Canadian Mounted Police, the Canadian International Trade Tribunal and the Transport Agency of Canada. She has given mediation perfection seminars to mediators at the Centre de Médiation et d’Arbitrage de Paris, Aix Médiation (France), Quebec’s Commission des Relations du Travail, and the Commission des Lésions Professionnelles du Québec. Since 2005, she was also responsible for the course in civil, commercial and labour mediation, which accredits civil mediators with the Quebec Bar, and courses in interest-based negotiation, which are part of the Bar’s continuing education program and continues do give this class as an independent dispenser. 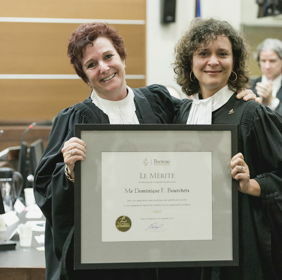 Merit of the Longueuil Bar for her contribution to the development of mediation in Québec since 25 years. Read the allocution that Me. Bourcheix gave regarding the challenges that mediation will face in the upcoming years.